Ilôs* is a card playing and tile-laying game pitched around the family/gateway level. You can play with two to five players, with games lasting anywhere from 20 minutes to an hour depending on the number of players. The age suggestion of 10+ is about right, but gaming regulars of 8+ should easily cope with the mechanisms on display here. While set in the imaginary land of Ilôs, it has a ‘trading in the Mediterranean’ feel – but before you run screaming, look at that smiling man on the cover! This nice cartoon art style runs throughout the fantastic components and, while largely themeless, the game has plenty of character. In the Carcassonne-sized box you’ll find 90 cards, 75 wooden player pieces, 20 cardboard tiles, more than 160 cardboard chits and 5 player screens and boards. 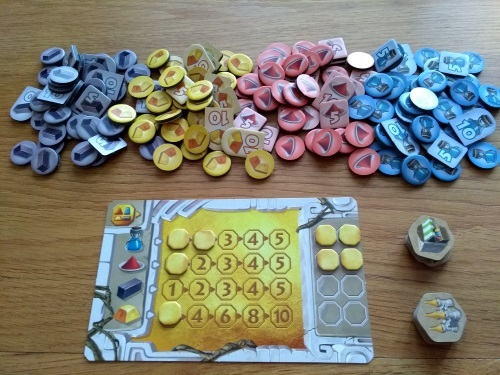 All these components are of a very high quality, with just the exchange rate chart and its tokens being a little flimsy; but these are hardly touched during the game. The game doesn’t seem to be currently available direct into the UK, but a US release is planned for 2018 (which will see it arrive here, hopefully in the £30-40 price bracket). The rules for Ilos are just six pages long and include plenty of examples. What the game does brilliantly is take several common euro game ideas, distil them to a pure form, then put them together to create a unique experience. The game is driven by a card system which is akin to San Juan or Race for the Galaxy (where playing one card means you generally have to discard other cards to do so), but with the card pile limited to just six different cards. 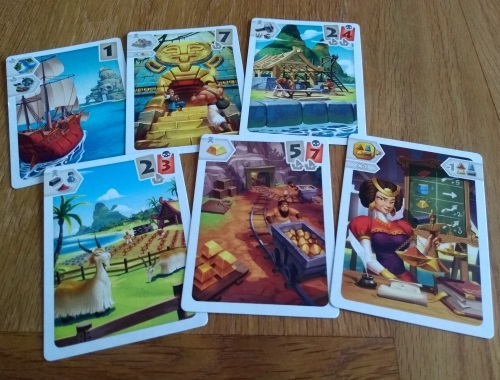 These cards allow you to move (place or move ships); establish settlements (plantations, gold mines or buildings – which all generally earn you goods each turn), search ruins or affect the value of goods on the market. Until the tile stack runs out (there are four tiles in play per player), a move action allows you to also place a tile (Carcassonne style). All tiles have islands and sea on them, and you place one of your five ships on the new tile. Alternatively you can move an existing ship you have (or place a new one) onto any existing tile. You will either place on a shore (allowing you to then establish settlements on that island) or on a pirating space (meaning all other players establishing settlements on islands on that tile have to pay more cards to do so). You will need to have one or two ships on a shore to start a settlement, with the type of card played and number of extra cards needed (including those pesky pirates) often limiting your options. Most tiles have a number of spots for your pioneers, but each space can only hold one – so it’s first come, first served. Each pioneer placed will then give you one income of the commodity you settle on (ebony, spice, pigment, or gold). Alternatively you can sometimes build a fort (which protects you from pirates) or trading post (which copies a production spot already occupied on that island). Raiding ruins just gives a one-time three gold bonus, but this can be powerful as gold has the potential to be twice as valuable as every other commodity. Finally, the market card action is what really drives the game. Instead of costing extra cards to play, this action costs you one good of the type you want to inflate the price of. The trick, of course, is that once you up the price of a good everyone else will want to hoover up any available spaces that make it. But conversely there are only eight price rise markers in the game, and once they’re gone the market is set – so you can’t leave it too long to make your move. On a turn a player can make any number of actions, as long as they have the cards to do so. There is no hand limit, so you could potentially save up for a massive turn – the only caveat being that if the draw deck runs out the current player draws any extra cards they need from the player with the most cards. The number of cards drawn each turn is three, plus one per ship you have on the board and one per fort built – so thee is extra incentive to get those ships out early. 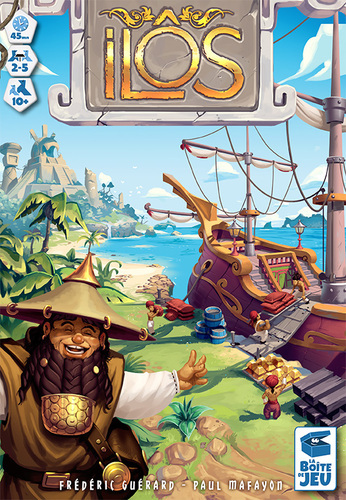 The game ends when one player has placed all 10 of their pioneers onto spaces on the islands. Players then simply multiply the amount of each good they have by its market value to determine the winner. The writer: Designer Frédéric Guérard has done a great job of combining simple mechanisms into a new game that comes together beautifully, while using a fictional location has avoided potential thematic banana skins around the topic of colonisation. While the game is best at 3-4 players it is still fun at both two and five, making it one of the very best family/gateway games of those arriving at Essen 2017. It’s a shame that, right now, it is almost impossible to find in the UK. The thinker: While Ilos isn’t the deepest game out there, and you can occasionally be let down by the luck of the draw, if played with a ‘super filler’ attitude it works very well indeed. The very limited opportunities to increase values in the market is a key dilemma throughout, changing each play; while the game sets up and plays quickly (you can get it played in 30 minutes with an experienced group). And due to its familiarity it is a very easy teach to experienced gamers. But no, this is not a very strategic game – much more a short tactical one. The trasher: While this isn’t a strong game in terms of player interaction, the piracy spaces actually make a significant impact. Especially early on you’ll find yourself scrabbling to do two or three actions in a round – so having to pay a few extra cards is painful. This makes it a pretty good attacking move (especially with less players), but also defensively – it’s much less likely for ships to land on the same island as you if you’re pirating its seas! The market is also fun to watch: it costs you to up a value, which in turn makes it hard to stay ahead of the curve. All in all, I like this one more than I thought I would. The dabbler: As well as looking gorgeous and appealing to families in the process, Ilos is deceptively simply despite having quite the component list. It actually shares quite a few touch points with games such as Ticket to ride: it plays two to five players in around an hour, while you can wait until your go to make your decisions as the landscape can change quite a lot once around the table – so you can socialise a bit while you wait! Even later, when you’re drawing 8-10 cards, the decision space doesn’t grow: in fact it shrinks once the market closes and some of the spaces on the tiles run out, leading to a quick final land grab. Ilos feels very different with two players, especially compared to four or five. The real difference is that you only use eight of the 20 tiles, which can give big disparities in what commodities become available. This may annoy those who like to plan a more predictable strategy. While I enjoy the fact the game blends familiar mechanisms to make something new, some players will simply look at it as ‘nothing new’ – which is a fair argument. Nothing here will surprise the regular gamer and descriptions such as ‘middle of the road’ can’t really be argued with – I have seen it described as ‘flat’ and ‘unexciting’. But my argument would be that, seen as a super filler, I see it as a lot better than those descriptions. But no – this is not a game that will be the mainstay of many gamer group evenings. Going into Essen I had high hopes for Ilos and it has largely met those expectations. The game is light, fast, simple to set up and explain; but the market and randomness of the tiles and cards add just enough to keep it interesting. I’ve had no complaints from anyone I’ve played it with, across all levels of experience, and in fact several people have been very much taken by it. Personally I’d rather reach for this than, say, Carcassonne (I’m not saying it’s a better game) – and because of that it will definitely be staying in my collection. * I would like to thank La Boite de Jeu (via Blackrock Games) for providing a copy of the game for review.